927 million lives were touched by our products last year, and while we are proud of that we must ask ourselves: in this world of rapid digital and technological transformation, how will we reimagine medicine and continue to bend the curve of life? We believe the answers are found when curious, courageous and collaborative minds like yours are brought together in an inspiring environment. When you’re given the opportunity to explore the power and potential of data and digital. Where you’re empowered to risk failure by taking smart risks. When you’re encouraged to share new ideas that’ll open up new ways of making things happen, and when you’re surrounded by teams who are equally determined to transform lives by tackling the world’s toughest medical challenges. Join our Novartis Graduate Program and help us reimagine medicine. 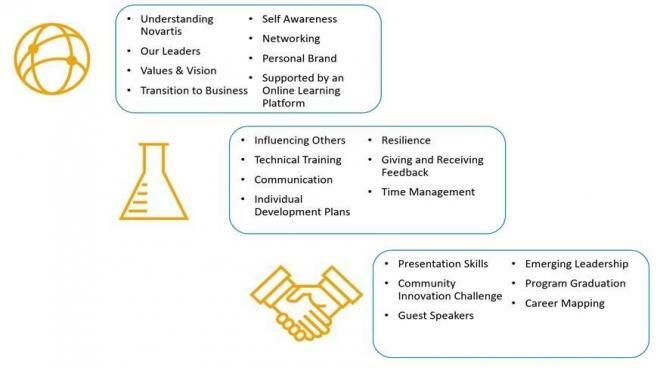 The Novartis Graduate Program will challenge you to be the best version of yourself from the outset of your career. You will have exposure to our leaders from across the business, and access to a structured support community that will include buddies, mentors and coaches. You will discover different areas of the business through a minimum of two rotations over the 18-month program and will embark on a development journey designed to challenge you both professionally and personally. Novartis strives to unleash the power of our people to reimagine how we can be on the leading edge of understanding and impacting human health. As a graduate, you will be continuously challenged and empowered to deliver transformative innovation in a rapidly evolving industry. We are seeking graduates who are driven by our purpose and are constantly curious about new ideas that can produce better outcomes for our patients and customers. You will be an individual who is readily able to collaborate with your team. As a Novartis graduate, you will be supported to achieve your professional and personal goals and prepare yourself to be a leader who can enable their own team to reach their full potential. As a graduate at Novartis, you will be courageous and tenacious to strive for greatness. You will embrace operational excellence each day, understanding that the combination of innovation and excellence in commercial operations is at the core of what we do and allows us to make a difference for our society. Our roles will commence in July 2019. Applications for our 2019 Graduate Program are now open. Apply here!